Enhancing Value and Quality in Accordance with Shariah Principles. 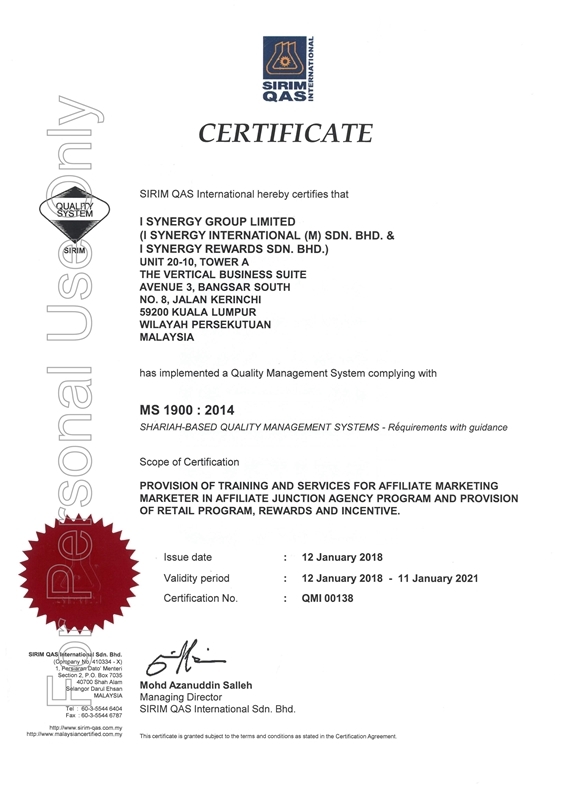 I Synergy Group Limited is officially a Shariah-Compliant company as of 12 January 2018. iSYNERGY has obtained the MS 1900:2014 SHARIAH-BASED QUALITY MANAGEMENT SYSTEMS certification from SIRIM QAS International Sdn Bhd, Malaysia’s leading certification, inspection and testing body under SIRIM Berhad. This certification officially verifies that iSYNERGY is in compliance with internationally recognised Shariah requirements. Therefore, the nature of the company’s primary activities, namely the training and services for affiliate marketing marketer in Affiliate Junction’s agency program and its retail affiliate program’s operations, the rewards and incentives are all in accordance with the Shariah governance regulations. Being a Shariah-Compliant organisation is a significant feat for us as it ensures iSYNERGY’s affiliate marketing platform maintains the high standards of operations and products, and will continue to deliver great value, quality and excellence to all of our stakeholders. To comply with Shariah standards in our primary business operations. Spearhead and apply Shariah regulations in the operations of the affiliate marketing platform. Integration of Shariah Compliance business practices by Shariah experts and industry practitioners. Facilitation and development of well-rounded affiliate entrepreneurs in the affiliate marketing platform. Meeting the market needs while being inline and guided by Shariah principles. Enrich resources of knowledge in Islamic perspectives. Propagate harmonisation and mutual respect in Islamic practices. Provide avenues for the development of Shariah practices. To become a fully integrated Shariah Compliance affiliate marketing network and solutions provider as well as ensuring the best levels of service standards and convenience to customers. To provide our stakeholders with flexible and convenient Shariah Compliance marketing solutions. To be true and honest to yourself, God and others. To always have integrity, as well as straightforwardness of conduct in accordance with Islam. To uphold the Islamic principles and sound moral conduct that is inherent in the notion of honesty, courtesy and respect. To convey the truth and act in accordance to verifiable facts without any hidden agenda. To act with soundness of belief and wisdom in solving any issues in an intelligent and succinct manner. The Department of Standards Malaysia (STANDARDS MALAYSIA) is the national standards and accreditation body of Malaysia. STANDARDS MALAYSIA has appointed SIRIM Berhad as the agent to develop, distribute and sell Malaysian Standards. Established on 1 March 1993 under the Securities Commission Act 1993, SC is a self-funding statutory body with investigative and enforcement powers. It reports to the Minister of Finance and its accounts are tabled in Parliament annually. JAKIM is a government authority in Malaysia that strives for leadership excellence in the country’s Islamic affairs management. Q1: What is Shariah Compliance? Shariah Compliance means ensuring that the organisation is effectively managed in accordance with universally accepted values like discipline, honesty, justice, sincerity, timeliness and truthfulness. The halal and non-halal aspects of all processes vital for the delivery of services and products must also be identified and communicated to all employees as well as implemented effectively. Q2: What are the benefits that a company gains from being Shariah-Compliant? Ensure that the universal values of justice, honesty, truthfulness, sincerity, timeliness and discipline are integrated into your quality management practices. Place greater emphasis on ethical standards in business processes. Receive independent assurance that your organization’s processes and practices are in accordance with Shariah principles. Q3: How will Shariah Compliance affect my daily business activities as an affiliate or advertiser with Affiliate Junction? Your business activities will continue as per usual. Further to that, affiliates are now given the option to only opt to promote and earn commissions from Shariah Compliance advertisers only. Q4: As a Muslim Affiliate, will my income from Affiliate Junction be 100% Halal? The Shariah certification body, SIRIM QAS International, has diligently conducted the audit of every business process in Affiliate Junction’s agency program and the retail affiliate program, MyKad Smart Shopper, including on the ‘Halal Filtering System’ mechanism to ensure we meet the high standard of Shariah Compliance requirements. As a result, I Synergy Group Limited is now certified Shariah-compliant for the aforementioned scope. Thus, be rest assured that your income from Affiliate Junction’s agency program and MyKad Smart Shopper is 100% halal. Q5: Can a non-Muslim affiliate/owned business still participate in Affiliate Junction? Yes, absolutely. There is no such restriction that will be imposed on any non-Muslims parties. Q6: When did iSYNERGY become Shariah-Compliant? iSYNERGY officially received its Shariah-Compliant certificate on 12 January 2018. Q7: What is the certification received by iSYNERGY that verifies its Shariah-Compliant status? The certificate that iSYNERGY received is SIRIM QAS MS 1900:2014 Shariah-based Quality Management Systems. Q8: Why SIRIM QAS International? SIRIM is the first certification body in the world to offer MS 1900 certification. MS 1900 certification services are supervised by the Shariah Advisory Council (SAC) which is made up of eminent religious scholars thus ensuring credibility. Their highly experienced and professional auditors are competent in a wide range of sectors. Q9: What processes did iSYNERGY had to go through to achieve the MS 1900:2014 certification? Q10: How can a company maintain Shariah Compliance in the system? 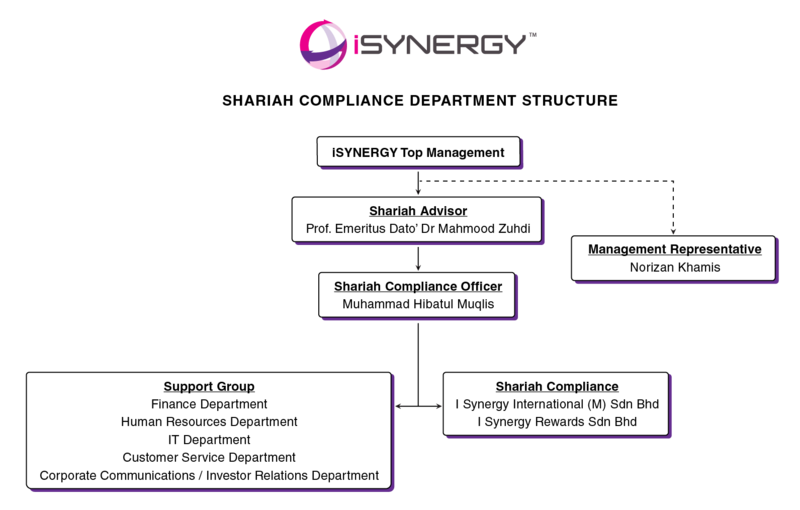 iSYNERGY must ensure that they are continuously improving their business operations and values in accordance to Shariah principles, which will be ascertained by SIRIM QAS through annual Shariah audit (or as required). Q11: How can I get more information about iSYNERGY’s Shariah Compliance status? Join our mailing list to get announcement, news & updates from us! Copyright © 2018 I Synergy Group Limited. All Rights Reserved. Prof. Emeritus Dato’ Dr. Mahmood Zuhdi b. Hj. Abdul Majid was born in Kota Bharu, Kelantan in 1945. His schooling began in 1950, under his own father’s guidance in Madrasah Majidiyah, Kg. Kayu Rendang, Melor, Kota Bharu, Kelantan. Additionally, during his secondary school, he studied in Maahad Muhammadi Kota Bharu, Kelantan and Yayasan Pengajian Tinggi Islam, Kelantan for his university which is now called Akademi Islam Universiti Malaya. He holds a number of Shariah-related degrees from Malaysia and abroad, namely the Bachelor of Shariah from University al-Azhar and Bachelor of Southeast Asia from University of Kent, England. Furthermore, he received his PhD in Shariah from University Malaya. Previously in the academic field, he holds the title of Dean Shariah Faculty for the past 5 years and shortly after, the title of Director of Academic of Islamic Studies in University Malaya. He was a professor in Shariah at the University Malaya since 1995 and then moved to International University of Islam Malaysia (UIAM) as a professor in the Jabatan Fiqh and Usul Fiqh in 2008 and holds that title until July 2016. During that period as well, he also holds a title of Dean in International Institute of Islamic Thought and Civilization (ISTAC) and Dean of Kulliyah Ilmu Wahyu and Sains Kemanusiaan (IRKHS). In 2011, he was awarded by University Malaya with the title Professor Emeritus. In the field of Islamic Finance, he is currently a Non-Executive Director of Public Islamic Bank Berhad (PIBB) as well as the Chairman of Sharia Committee PIBB. Other than that, he is also a Chairman of AIA Public Takaful Shariah committee and Chairman of Bank Islam Malaysia (BIMB) Securities Shariah committee. Besides that, he is a committee for Shariah Permodalan Nasional Berhad (PNB), Amanah Mutual Berhad (AMB), and as-Salihin Trustee Berhad too. Previously, Dr Mahmood Zuhdi was a member for The Council of Scholars for International Shariah Research Academy for Islamic Finance (ISRA), Bank Negara Malaysia for 6 years. In the other fields, he is the Chairman for Majlis Dakwah Negara, Deputy Chairman of Lembaga Pendidikan Islam Malaysia (LEPAI), Board member of University Islam Malaysia (UIM), Board member of Pemegang Amanah Yayasan Dakwah Islamiyah (YADIM), Board member Penasihat Institut Wasatiyyah Malaysia (IWM), member of Majlis Perunding Islam Malaysia (MPI), and an Advisory Board member of Shariah for the certificate of MS 1900:2005 SIRIM. Other services that he has contributed previously was being a member of the committee of Fatwa Negeri Kelantan (1990-2012), Panel Judge of Makhamah Rayuan Shariah Negeri Kelantan (1990-2012), Board member of Dewan Bahasa and Pustaka (DBP) (2006-2012), Board member of Pemegang Amanah Yayasan Pembangunan Ekonomi Islam Malaysia (YaPEIM) (2004-2013), Commissioner of Hak Asasi Manusia Malaysia (SUHAKAM) (2010-2016) and Chairman of Majlis Dekan Pengajian Islam (2012-2014). Up until now, he had produced 34 books and contributed 26 articles.